← Austerity is a scam but green growth isn’t the answer either. We are launching The Viable Economy today, Tuesday 9th December, 7-9pm at Central Hall, Oldham Street, Manchester. Book your free place HERE. More details of launch at the end of this post. Copies will be on sale there, or you can download the pamphlet as a pdf file , HERE We are unfunded so please make a donation – £2.50 will cover our costs. Donation page link. Today we launch “The Viable Economy”, a pamphlet for everyone concerned about the dangers we face from the current unviable economic system and who would like to explore an approach that integrates economic, social and ecological well-being. It suggests a path to a resilient, more localised, stable economy that delivers what we all need and will ensure more equity and harmony in our own area and throughout the world. It argues that we can decide on rather than follow economic rules and tread lightly on the earth as well as protect and restore those systems that make life possible. It argues that to do this we will need a system based on values that include stewardship (caring for the earth), justice, conviviality (community), solidarity, co-operation, equality and respect. It is in update of Steady State Manchester’s 2012 launch report In Place of Growth (available here). While not fudging the problem of our ecological overshoot (the real deficit), it presents a positive message of an economy that works for all, for us in Manchester and the people at the other end of our supply chains and pollution, now and in future generations. That sounds like a strong claim, and while we are confident about the central principles we do see this as work in progress, and welcome constructively critical feedback so we can improve it. Why is the current economic system unviable? We are continually told that economic growth is essential to all our well-being; it has such a hold on our imagination that we can scarcely believe we can live well without it. From 1945 until the 1970’s, the standard of living of many people, in Western countries increased. Real incomes for many have declined in the West since then, and many in the majority world have become increasingly poor. Since the 1970s stagnation has haunted the economy, temporarily lifted through a series of increasingly desperate ‘fixes’ of which ‘financialisation’ and the gross expansion of consumer credit are only the most recent. Meanwhile, current austerity policies illustrate how greater equality is continuously postponed. Despite increasing inequalities locally and globally, the powerful growth lobby continues to say that given growth, prosperity will trickle down. But as we cope with instability and repeated crises; it is increasingly difficult to control the actions of big business and working conditions are getting worse. More and more decisions are made on the basis of narrow criteria of efficiency and profitability; this influences how we think, politics and even culture. As Margaret Thatcher wanted, everything is reduced to economic activity, with the emphasis on profit and the free market, with “no such thing as society”. This economic system damages society. Some people and areas are highly valued while others are left out. Many people are dissatisfied with everyday life (some studies say dissatisfaction is higher in the UK than in places which are far poorer,) and the political process feels irrelevant to many people. Increasingly our lives are more individual, separated and apolitical. Institutions and values which nurtured togetherness, solidarity, co-operation and a sense of community are less valued. Has this led to widespread feelings of pointlessness and insecurity, and high levels of stress, anxiety disorders, depression and addictions? Rising inequality has increased levels of insecurity and most worrying, a lack of social solidarity – the very basis for our shared life. Even more distressing, we are using more ecological resources than our planet can cope with. As the Intergovernmental Panel on Climate Change’s (IPCC) most recent report has shown, it is economic growth that is responsible for the most immediately threatening increases in greenhouse gas emissions that threaten runaway global warming. And climate change is just one of the ‘planetary boundaries’ that humanity is crossing, or approaching, threatening the very basis of life itself. That then is the nature of the problem. So what is the Viable Economy? The Viable Economy is not something we have just dreamed up but a way of bringing together a number of ideas and practice into a framework. That is resilient in the face of bubbles, crashes, supply chain interruptions and the whim of National governments. That delivers (and measures) what we need; where some sectors will grow,(e.g. renewable energy) and some must shrink (e.g. fossil fuels, financial speculation, armaments). Where more money stays local and there is local control over savings and investment. Where investment comes from within rather than as profit-seeking from external investors. That builds equality, solidarity and co-operation among people, here and elsewhere. Has more space for non-commercial transactions (including care of children , adults, neighbourhoods and exchanging services and skills: the collaborative or solidarity economy. Radically reducing both the use of limited resources and the emission of pollutants, including greenhouse gases: a one-planet economy. Based on production and consumption for need: a frugal abundance. Resilient to climactic and other ecological shocks. An economy that practices stewardship of the natural world that we depend on. The pamphlet draws on ground breaking thinking of recent years from a variety of fields and movements, including New Economics and Degrowth, Social Justice, Social Ecology, Trade Justice and Alternative Development, bringing them together because ecology teaches us that everything is interconnected. It covers eleven critical areas: growth; resilience; space; democracy and ownership; investment, money, credit and debt; distribution and equality; work and income; environment; consumerism; living well and its measurement, and population and migration. For each area there is an outline of the current problems, the viable alternative and some viable policy ideas. The themes that constantly run through these 11 areas are equality, localisation, money and measurement. We argue that greater equality is needed globally as well as locally and economically as well as socially. We recognise that greater equality is needed wherever there are preventable gaps if everyone is to live well and the economy if to be viable. This includes within Manchester and compared to other places locally and throughout the world as well as in terms of gender, race, sexuality and disability We argue that localisation of the economy can have an enormous impact on reducing ecological damage and ensuring a more stable and less exploitative approach to money.. We also consider the urgent need to measure wealth of society, not by how much we produce (Gross Domestic Product) but by measures that consider the value of what we produce, who benefits, and any damage to the planet as a result of the activity. We include a section of population and migration, an area we have not previously explored where we suggest that the focus of action needs to be on the reasons why people have large families and want to migrate, rather than on control. We are launching The Viable Economy on Tuesday 9th December, 7-9pm at Central Hall, Oldham Street, Manchester. Book your free place HERE. Copies will be on sale there, or you can download the pamphlet as a pdf file , HERE We are unfunded so please make a donation – £2.50 will cover our costs. Do come along – but it does help if you could book via eventbrite to give us an idea of numbers. Gudrun Cartwright, Head of Marketplace Sustainability, Business in the Community. 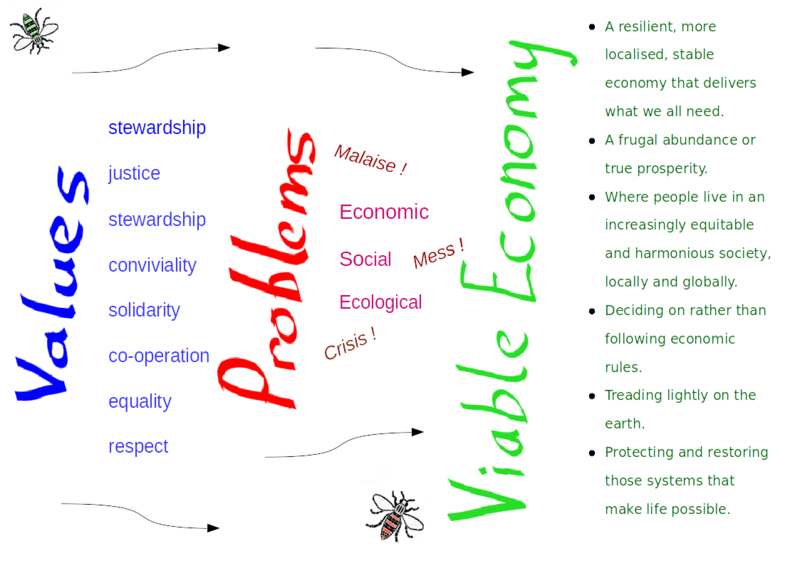 “Business in The Viable Economy”. This entry was posted in news, upcoming events, Viable Economy and tagged degrowth, economic growth, economy, equality, post-growth, re-localisation, resilience, social justice, steady state economy, viable economy, well-being. Bookmark the permalink.